"How does one deal with a bully? Find an ally! Andy has the best one of all-his Granny Webb is there to support and encourage him while also helping the bossy Dolores learn an important lesson. Rachael Lillis narrates with aplomb. She nimbly switches between well-voiced characters, moving the story along at a pace suitable for enjoying its important moments. Lillis reads with a slight undercurrent of humor in her tone-as if she and the listener are in on some inside joke. We know Andy will survive Dolores. 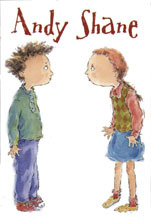 Lillis ably captures the personalities of the characters and brings this universal story to life. Fun listening-again and again."